Columbia Convalescent Center - For people who expect more. Skilled nursing care in Columbia, Illinois. Whether your stay is long or short-term, experience the luxurious living quarters, upgraded amenities and beautiful scenery that our grounds and center have to offer. Participate in some of our many activities, cook or bake your own food with the help of our staff in our resident kitchenette, relax in our beautifully landscaped courtyard and be assured that our caring staff is nearby to assist in anyway necessary. Columbia Convalescent Center is a Medicare certified nursing facility that accepts private pay as well as Medicare and Medicaid for residency. With RNs on staff, we care for post-hospital discharge patients. 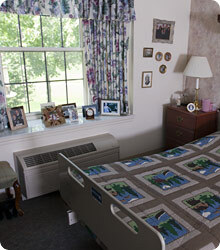 Enjoy our comfortable surroundings as we help you get back to a place where you will feel comfortable returning home. If skilled nursing care is what you need, Columbia's Convalescent Center is equipped with the state-of-the-art technology and a skilled staff to make your loved one's stay comfortable and enjoyable. With traditional architecture, beautifully landscaped surroundings, luxurious furnishings and an elegant dining room with a vaulted ceiling and baby grand piano, you will feel right at home when you come to visit or stay with us at Columbia Convalescent Center. To read more about our facility and amenities, click here. What does your facility look like? What amenities does your facility include? What type of services do you provide? Who lives at Columbia Convalescent Center? What type of activities are offered?